Sharepoint is one of the most versatile portal-based platforms which is used for creating, managing and sharing documents and also helps to customize web services. Introduced by Microsoft, Sharepoint has several components in precise combination and can solve various complex challenges. 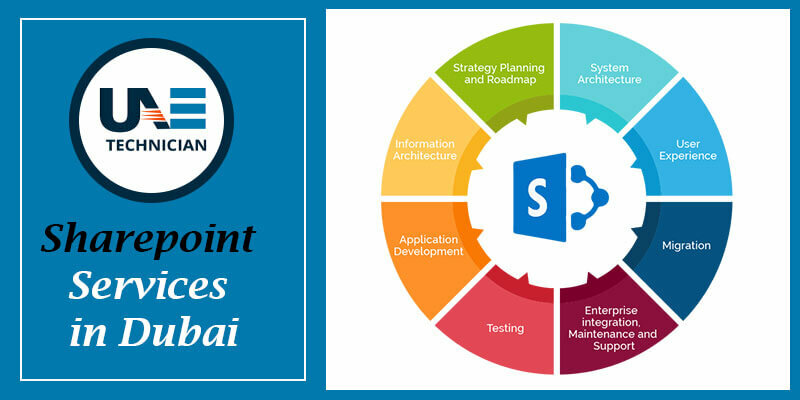 If you are searching for a trusted service provider who can guide you with the best Sharepoint services in Dubai, UAE Technician is the right place. We work with an outstanding team of developers who are well experienced in this field and hence do not fail to offer perfect solutions. Choose us and be assured of quality services. It offers a wide array of features that helps in initiating, tracking and reporting common business activities such as document review and approval, issue tracking and signature collection. It helps to ensure your sensitive business information which can be controlled and managed effectively. Sharepoint enables employees to make well-informed decisions. Office Excel spreadsheets to your employees from a Web browser through Excel Services running on SharePoint. Place a call at our helpline number: 042053349 and talk to experts at any odd time of the day. UAE Technician comprises of an efficient team of professionals who are always eager to assist you at the time of need. Worried about the service charge? We advise you not to entertain such worries. We care about your budget and hence try to offer best-in-class Sharepoint service at a minimal rate. Our online services are also quite popular. You can also drop us an email in our registered mail id during your busy working hours. Trust us and be ensured of quality service.